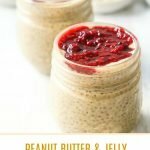 Low Carb Peanut Butter Chia Pudding with Jelly - keto snack or dessert! 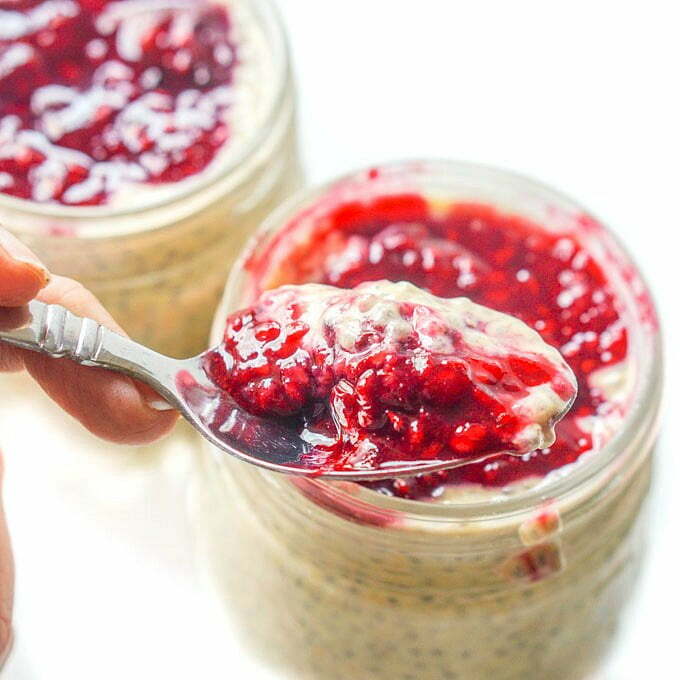 For the child in you try this low carb peanut butter chia pudding with jelly! 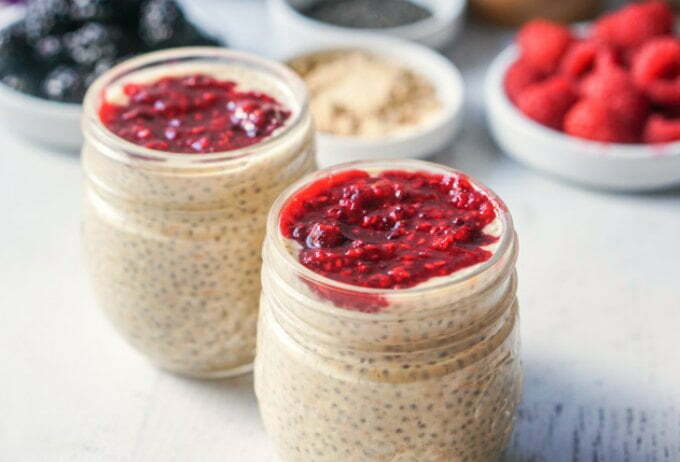 Creamy peanut butter chia pudding and a low carb berry jelly will give you a healthy version of that childhood favorite. Each jar has only 4.0g net carbs. You might also like this low carb peanut butter mousse ! I don’t know why but sometimes I crave PB & J on white bread. I guess it’s a memory from childhood or the fact that it’s just sweet on sweet on sweet. However I can’t eat that anymore as it just has too much sugar. 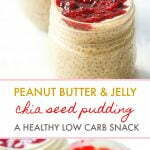 So I find other concoctions like this low carb peanut butter chia pudding with jelly to satisfy my pb & j craving. It’s fantastic! It’s smooth, creamy and filling and the perfect healthy low carb snack! 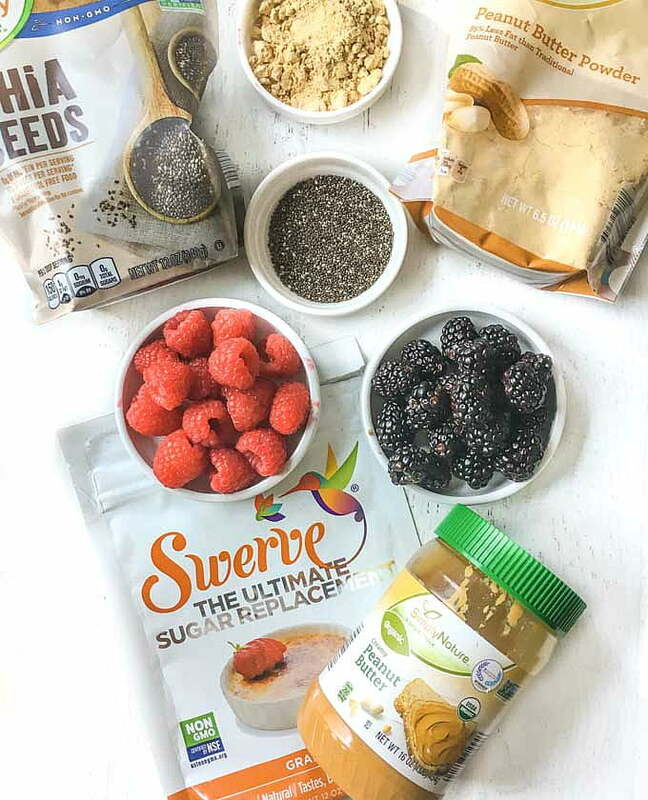 The ingredients for this low carb snack are chia seeds, peanut butter powder, peanut butter, almond milk, Swerve sweetener and berries. All but the Swerve I bought at Aldi. You want to first make the peanut butter chia pudding with the chia seeds, almond milk and peanut butter products. And then make the jelly with the berries and Swerve. In a large bowl, whisk the peanut butter, peanut butter powder, Swerve sweetener and almond milk. Once you get that well incorporated, add in the chia seeds and mix well. Spoon into two jars and refrigerate for an hour or two. You might want to mix it up after an hour or so if the seeds get clumpy. Or just mix it really well before you add the jelly. This is very easy. I used use both raspberries and blackberries because they are both very low carbs. Just add them to a small pan with a tablespoon or two of water and the Swerve sweetener. Let that cook down until it thickens and then spoon on the peanut butter chia seed pudding. 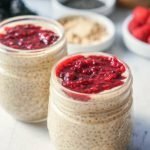 For the child in you try this low carb peanut butter chia pudding with jelly! 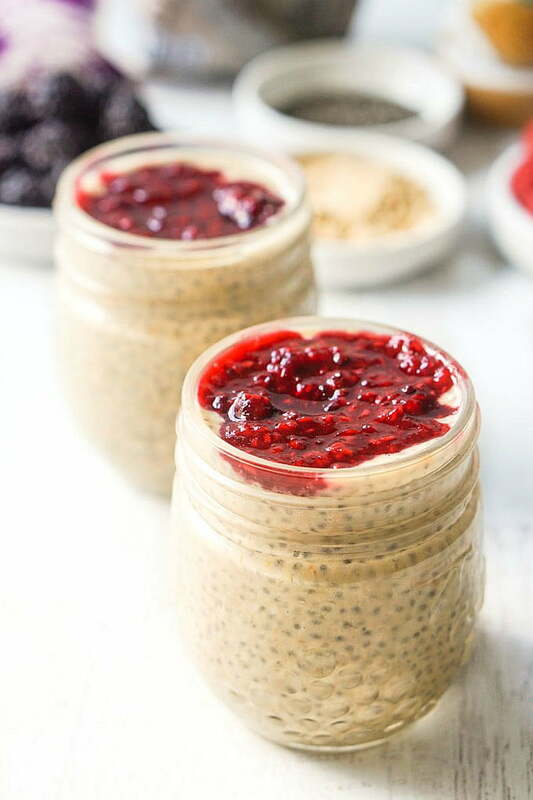 Creamy peanut butter chia pudding and a low carb berry jelly will give you a healthy version of that childhood favorite! Each jar has only 4.0g net carbs! In a larg bowl, whisk the peanut butter, peanut butter powder, Swerve sweetener and almond milk. Once you get that well incorporated, add in the chia seeds and mix well. Spoon into two jars and refrigerate for an hour or two. You might want to mix it up after an hour or so if the seeds get clumpy. Or just mix it really well before you add the jelly. Add the berries to a small pan with two tablespoons of water and the Swerve sweetener. Let that cook down until it thickens. Take off stove and let cool. 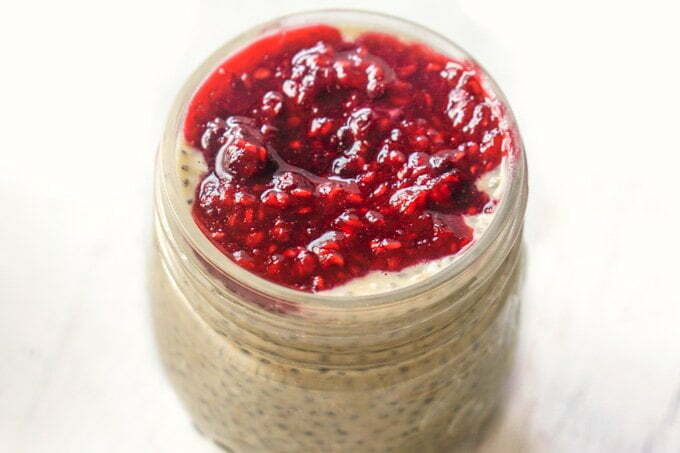 Spoon on the peanut butter chia seed pudding. NOTE: I used Aldi Simply Nature peanut butter and peanut butter powder. Both were low in carbs. I also used Swerve sweetener but you can use whatever sweetener you prefer.